Hometown: French Riviera, France Michael Tremain Sinterniklaas is an American Actor, Voice Actor, ADR Director and Script Writer who has worked for Geneon Entertainment, Bang Zoom! Entertainment, Bandai Entertainment, Media Blasters, New Generation Pictures, Funimation Entertainment, Viz Media, and Tripwire Productions. He has provided voices for a number of English language versions of Japanese anime films and television series, as well as video games. Sinterniklaas is the founder of NYAV Post, A Bi-coastal studio located in New York City and Los Angeles, which dubbed more than over 350 different anime titles and recorded several original prelay works. He was born in Netherlands, and moved to the United States when he was 10 years old. Sinterniklaas graduated from High School of the Performing Arts in New York City, and attended college in North Carolina where he did work at both Southwynde and Coastal Carolina Studios. 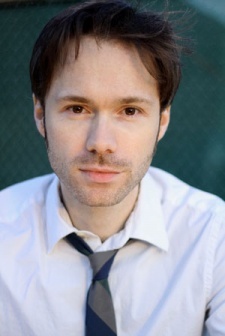 His most notable roles as a voice actor are Leonardo in the Teenage Mutant Ninja Turtles (2003 TV series) and Dean Venture (and other small parts) in the Adult Swim cartoon The Venture Bros., Mikey Simon in the Nicktoons series Kappa Mikey, and as Deady in the 2011 Friday the 13th event of the online MMORPG AdventureQuest Worlds. He is also a well known voice director, for a variety of shows like Berserk, Huntik: Secrets & Seekers, Kappa Mikey, Kurokami: The Animation, Magic User's Club, Mobile Suit Gundam Unicorn, Samurai Deeper Kyo, Slayers Revolution, Slayers Evolution-R, Let's Go! Tamagotchi!, Three Delivery and The Venture Bros. He started doing voice work and directing work in the west coast more frequently, and has started directing bi-coastal dubs of anime and prelay productions. He also replaced David Moo as Xellos in the English dub of Slayers Revolution and Evolution-R.